For the last two days of our trip we were happy to dispense with the car. On the first morning we had a couple of things to do downtown so took the Muni from outside the motel, it is a very good, cheap way of getting around town. The city was still cool and grey. I did the obligatory pilgrimage to City Lights Books and found Robert Moor’s ‘On Trails’ which had been on my list since I read a review a few weeks ago. The following day we walked through Golden Gate Park to the Botanic Gardens. There were the usual joggers, cyclists and a few people doing Tai Chi. I saw a Stellar’s Jay but didn’t manage to whip the camera out in time. At the gardens we enjoyed a couple of hours there. Sunset Piano had created a sculpture from three pianos, one of which can be played and it is installed at the entrance. There are ten pianos placed around the garden and recitals take place at various times over the next couple of weeks. When there is not formal concert, anyone is welcome to come and play. We heard several people playing well and one excruciating rendition of the Moonlight Sonata. Afterwards we visited two local bookshops: one sold new and used, James found something there. At the Great Overland Book Company I found a couple of books and we had a chat with the proprietor who, like many of the people we have met along the way, wanted to talk about Brexit. In the afternoon I did some beachcombing as the fog had gone and we had blues sky with only a little light cloud over the ocean. I took some bird photographs including these long-billed dowitzers. There are numerous small pieces of plastic waste on the sand but no sea glass. I did find some intact sand dollars. A local guy told me that he had just seen a young seal and that the sea just off the beach was a rich fishing ground. He also said that he had seen whales from the shore. Gulls were eating crabs on the shore and the dowitzers were probing the wet sand. I had hoped to get some sunset shots that evening but the fog returned a couple of hours before sunset and the strong wind was blowing sand around. The total miles walked that day was eleven. Yesterday it was time to fly back home. At San Francisco airport the police patrol the terminals on Segways. I noticed on Facebook that the London to Sydney Overland trip we were hoping to do in 2018 is ceasing after 2017 so 2018 might have to be the Big Lap in Australia. On the plane I watched as we crossed the Sierra Nevada, desert, the Rockies and sunset over Canada. The sun rose soon afterwards over the mountains, snow and ice of southern Greenland. As we started to descend over Ireland, I found it hard to adjust to seeing small green fields again but glad to be back home among them again for a while. The Lincoln Highway runs south from Layton towards central Salt Lake City and then turns west to the lakeshore where it joins I80. Commuters were heading into the city as we left our hotel yesterday morning but we lost them when we turned towards the lake and stopped off at the Saltair Resort Pavilion. There have been four in the last hundred years and this is the only place on the south shore of the lake that there is public access. Dog walkers were on the beach and geese swimming in a pool. Back on the interstate we passed a huge pile of salt very similar to the one outside British Salt in Middlewich in the UK. 95% of our salt is mined under Cheshire with only 5% coming from sea salt. The heap outside the works is used to de-ice the roads in winter. 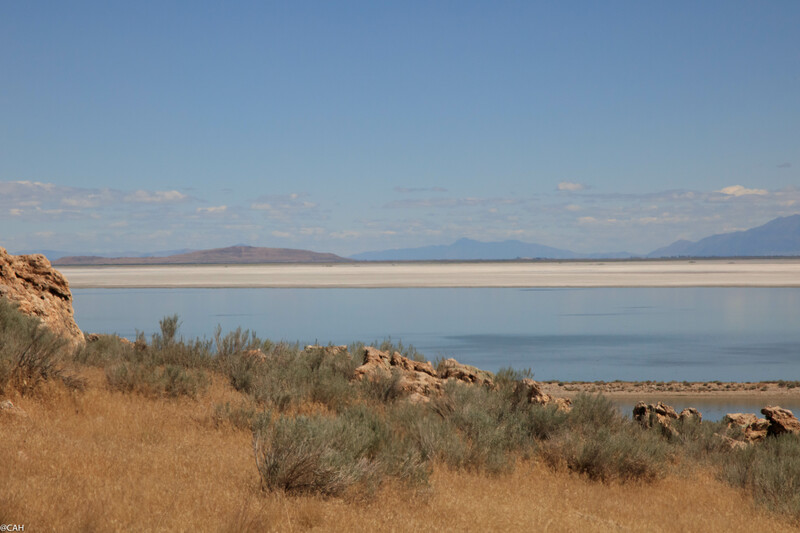 We stayed on I80 for most of the way to Wendover across the Great Salt Lake Desert. There were more southern alignments of the Highway here but they now run through private and military land and permission to travel on them must be requested. 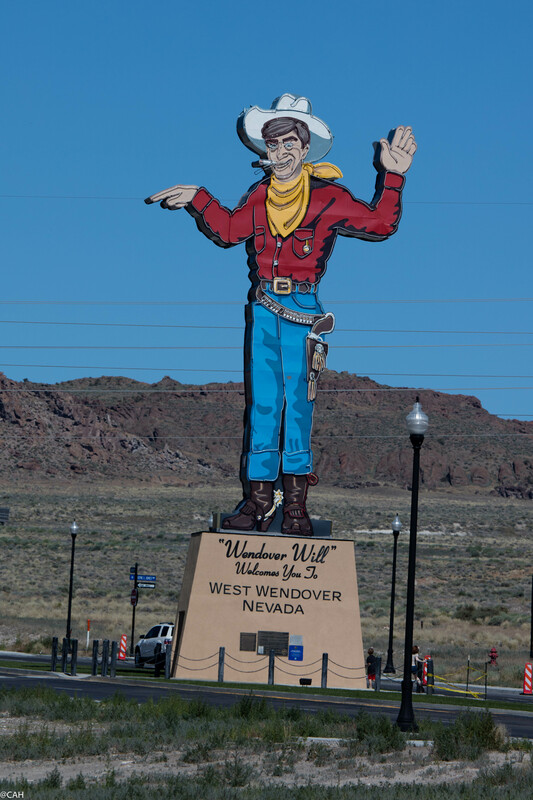 Between Wendover and West Wendover we received a welcome from the large cowboy in the middle of the road, crossed the state line into Nevada and the Pacific Time Zone. The Lincoln Highway then takes what is called Alt93 southwest. 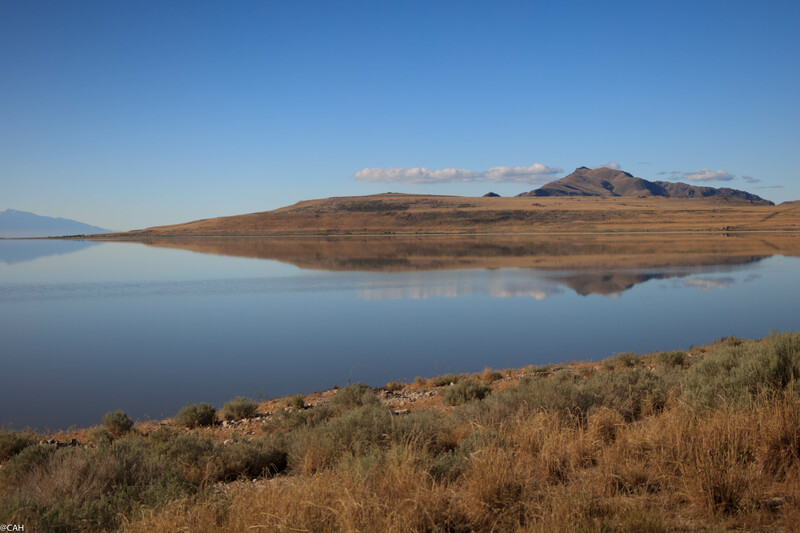 It travels over the White Horse Pass at 6045ft and at Lages Junction, joins US93 which is also known as the Great Basin Highway. At this point we had a completely blue sky with only one tiny cloud in sight. A few miles before McGill we hit more roadworks and were stationary for a time. We stopped in Ely, explored the North Nevada Railway Museum and had lunch in the shade. I have spent a fair bit of time on trains in several countries and my grandfather was a locomotive engineer so the museum was interesting and the railway in these parts mainly served the huge copper mine just outside the town. Heading out of town, we noticed that all the local sheriffs were inside one café so things must have been fairly quiet. 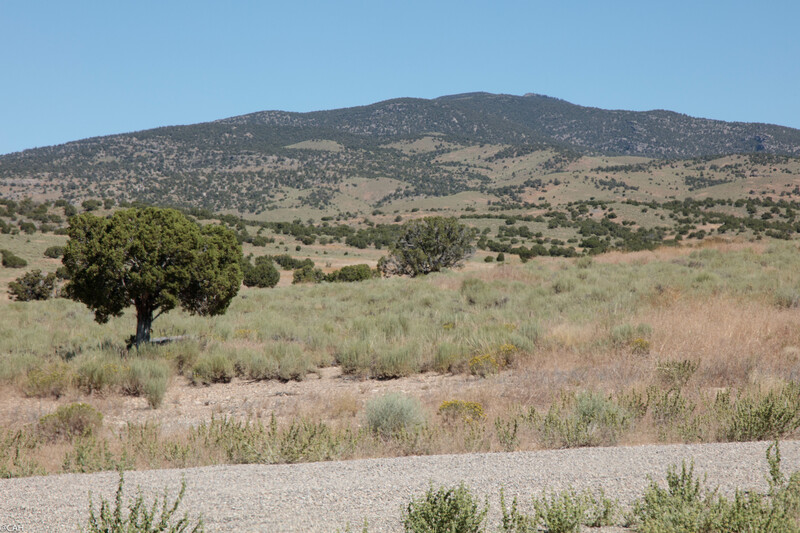 Highway 50 is billed as ‘Americas Loneliest Road’ and it was certainly quiet. We crossed over the Robinson Pass at 7588ft and then switched to an even quieter, lonelier road: Long Valley Road, another diversion from the Lincoln Highway. 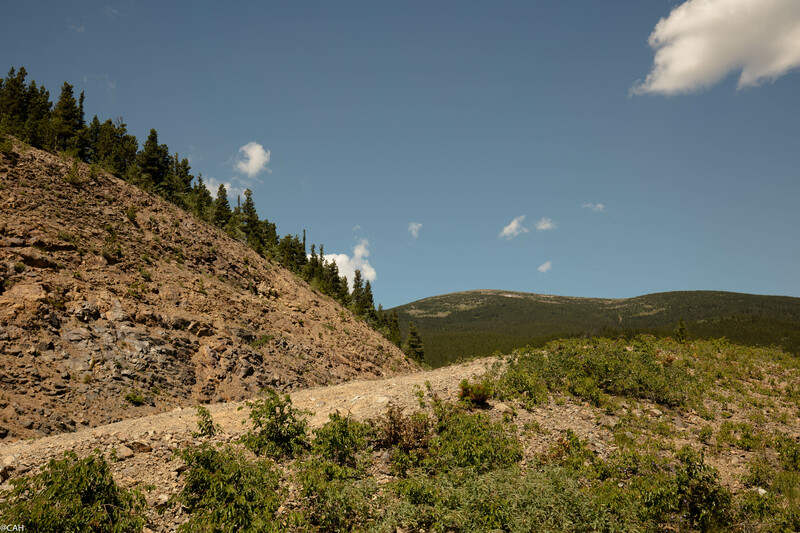 This heads north for 67 miles to Ruby Lake and has several gravel sections. We saw no other vehicle until we were almost at Ruby Lake and that was one wrecked car which had been abandoned. A sign informed us that we were also following the ‘California Trail Hastings’ Cutoff’ which later proved disastrous to the Donner Party. As we left Ruby Lake behind us, civilisation gradually appeared and after crossing Harrison Pass, we descended in Elko. 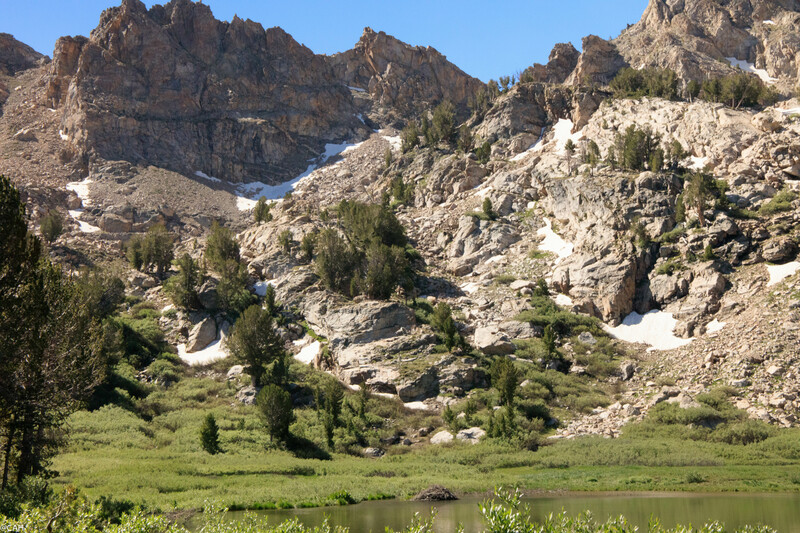 We based ourselves here for a couple of nights as a friend who used to live in Reno recommend the Ruby Mountains. 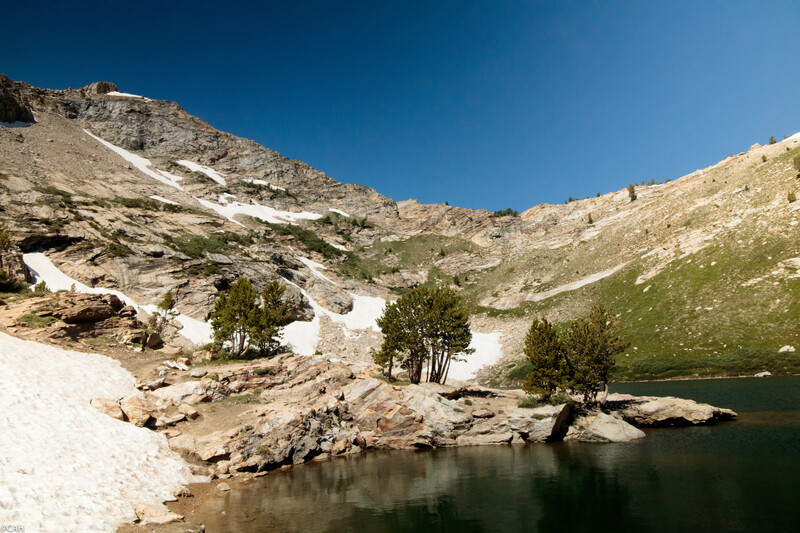 This morning we drove up to Lamoille Canyon and hiked from the trailhead at the road end, up to Lamoille Lake. On the way up the canyon, a large group of climbers were getting ready to tackle a steep cliff. Some University of Minnesota geology students were on the first half mile of the trail, examining the rocks and we met several runners heading back down the mountainside. Flowers were in bloom all around, I caught glimpses of some birds and we saw a few chipmunks. We had a rest at the lake and the walked back down talking to several who were on the way up. Lunch was at the side of the canyon road and we saw there had been rockfalls onto the road while we had been walking. Tomorrow we return to the Lincoln Highway and the Loneliest Road. The first thing to remember this morning was to send birthday wishes to my aunt who is 85 today. We then left Laramie on the relatively short portion of the Lincoln Highway which is on US30. 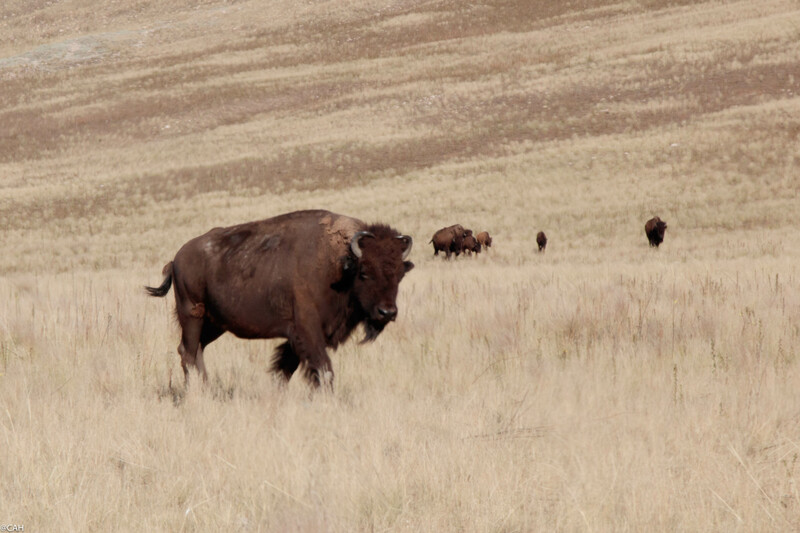 It heads into the prairie where cattle and elk were grazing. 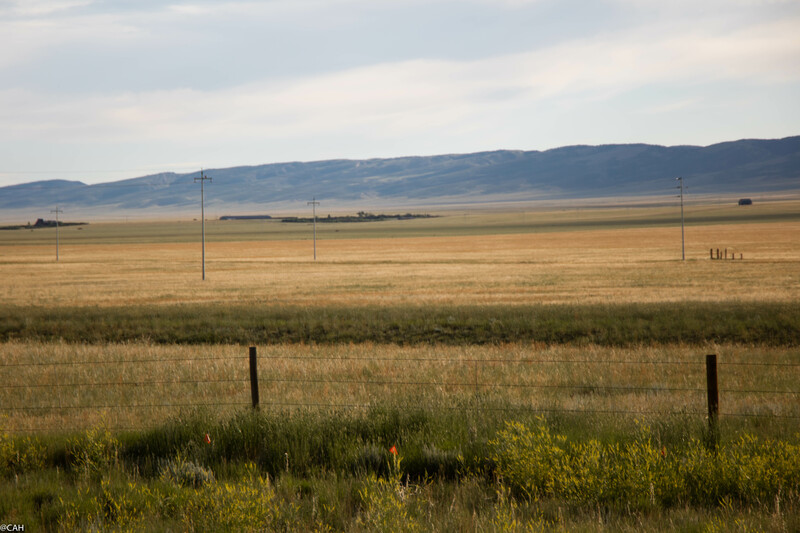 We had the Laramie Mountains to the right and the railway and Medicine Bow Mountains to the left. Signs informed us that we were on the Sand Creek Massacre Trail. I had to look this up and discovered that it was a massacre in the American Indian Wars on November 29, 1864, when 70 Colorado militia attacked and destroyed a village of Cheyenne and Arapaho, killing and mutilating around 70–163 Native Americans, about two-thirds of whom were women and children. One bizarre sight was seagulls so far inland. This does happen in the UK but we are never too far away from the coast, I did not expect to see some in Wyoming. I also spotted a heron perched on a rock beside a pool and a prairie falcon sitting on a fence post. Leaving Elk Mountain behind, the road all too soon joins the interstate and the Lincoln Highway route is I80 for the rest of the state aside from a few short stretches in towns along the route. It also reduces photographic opportunities. West of Rawlins we crossed the Continental Divide at 7000ft and the road runs just south of the Great Divide Basin. 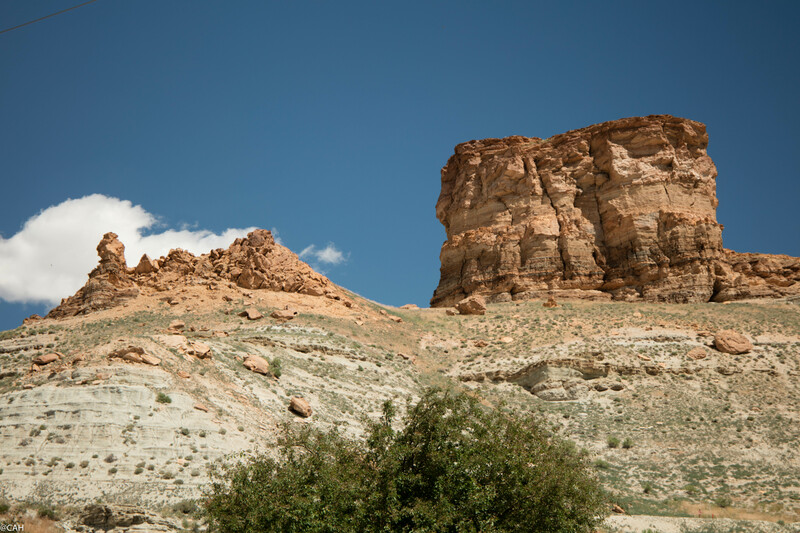 The names of towns reflect the passing landscape: Red Desert, Table Rock and Point of Rocks. We crossed the Continental Divide for the last time (6390ft) and descended past large quarries and rocky outcrops down to Green River where we had a good coffee. The river takes second place to the rocks surrounding the town. The only place in Wyoming I have seen a Lincoln Highway marker was at the museum but of course it was closed on Sunday. Back on the interstate the Wasatch Mountains appeared on the horizon. Near Granger, R30 leaves the Lincoln Highway having been with it since Philadelphia. It heads towards Grand Teton and Yellowstone which I would love to visit but we don’t have time for that on this trip. A small oasis just off I80 at Evanston is Bear River State Park. We had our picnic lunch here and had a short wander by the river but could not explore it fully as we had many more miles to do. I did learn that Wyoming has 31 varieties of willow which chimed with my experience in Australia when I tried to differentiate between the different gum trees before discovering that there are hundreds of eucalyptus varieties and giving up. The strong wind meant flower and plant photography was not possible. 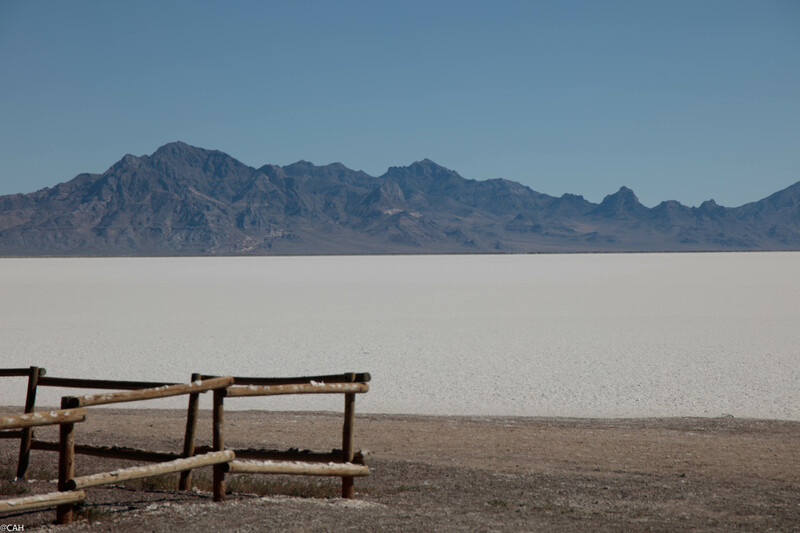 The Utah state line is understated with none of the ‘Welcome to……’ notices seen elsewhere. As we are in the mountains all the first exits have ‘no services’ but gradually we head further into the state. 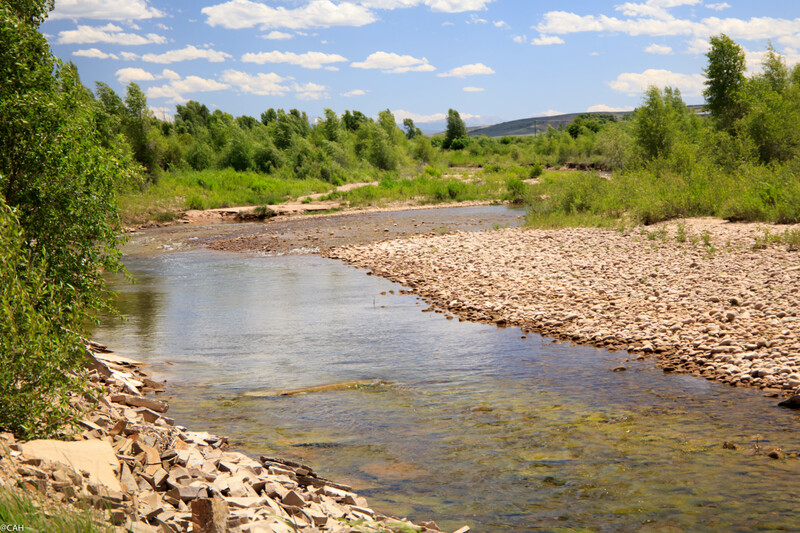 Red rock appears and Weber Canyon is shared with the railway and Sunday kayakers on the river. Signs reminded us that we are again sharing our route with the Oregon & California Trails and the Pony Express. We eventually found our hotel. Most of the surrounding restaurants were closed but an Irish Pub was open and provided dinner. The wind has brought cloud and rain to the mountains but we hope it clears for tomorrows exploration of the Salt Lake. As we left Boulder yesterday morning, several cyclists and climbers were also getting away. I had hoped to see Boulder Canyon Falls but they were closed due to a high risk of rockfall. Instead we had a break at Barker Lake in Nederland where I watched fish jumping and swallows diving for insects as it was too windy for flower photography. The plentiful insects also fed on me. Ducks were feeding with their ducklings and another bird on the water was too far away to identify even with binoculars. We had coffee in the hippyesque Happy Trails Café and relaxed on the comfortable seating there. It has the first restroom I have been in which has a skeleton lounging in a bath and a moose toilet roll holder. We continued on the Peak to Peak Highway and just north of Raymond had the first emergency braking for a moose running across the road. Something akin to the Elk Test that Scandinavian car manufacturers put their vehicles through. Twelve years ago in Victoria, Australia I had the iconic Australian experience of a kangaroo jumping over the fence and across the freeway in front of me. As we approached Estes Park the traffic got heavier and the Chapel on the Rock near Camp St Malo was also busy with visitors. The wind had brought clouds in and very soon we had a thunderstorm. 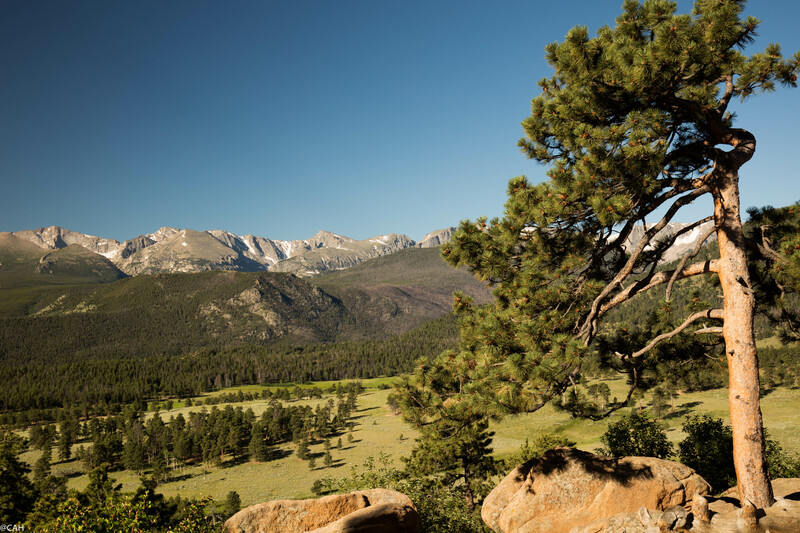 We spent the night in Estes Park to be ready for an early start in the Rocky Mountains National Park this morning. 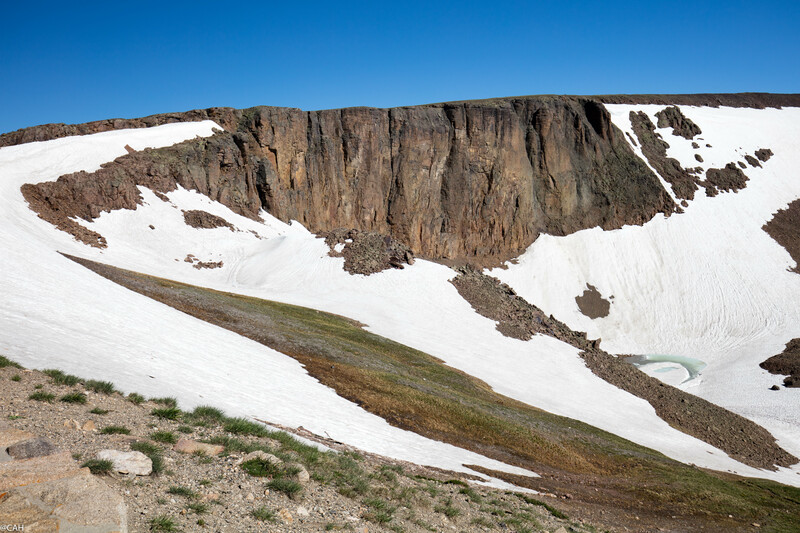 I had read all sorts of horror stories in guide books and the Park’s website about heavy traffic in the high season but we were treated to a fairly quiet run on the Trail Ridge Road – the USA’s highest continuous paved road. Its highest point is around 3,500m. 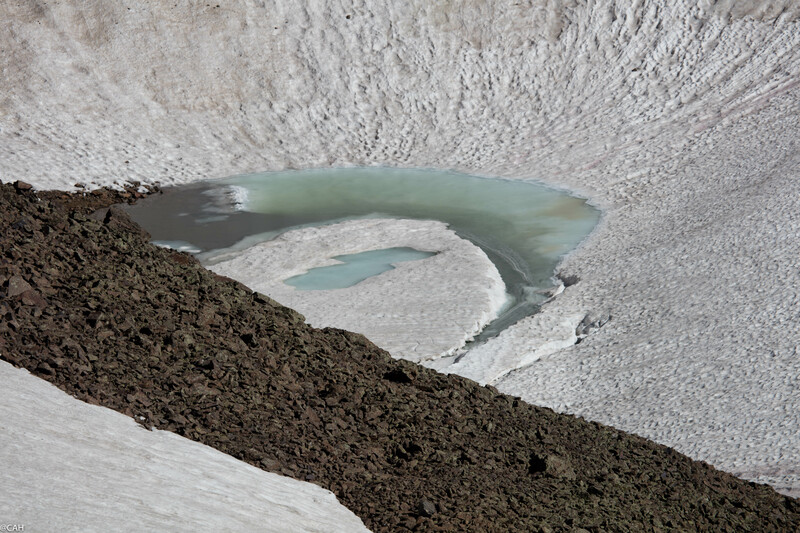 I had not been at such alpine altitudes and seen glaciers since my trip to the Himalaya in 2010. We saw some wildlife; several elk, a raven and had a close encounter with a Yellow-Bellied Marmot. 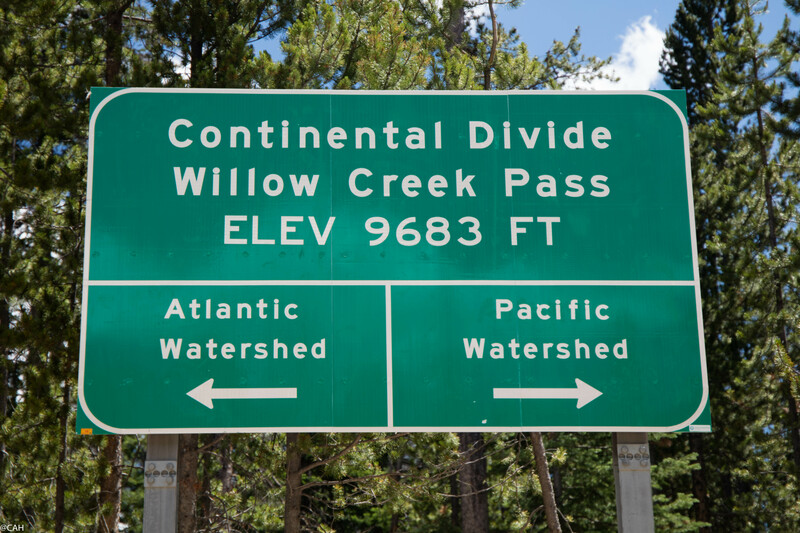 The road goes over the Milner Pass and crosses the Continental Divide. This zig-zags around in these parts and we crossed it later and will do again in Wyoming. We walked a small section of the Colorado Trail in the shade of the forest as it was starting to get hot and then descended into Grand Lake for coffee. The grass was growing around the snowmobiles here and boating was the big activity. Heading south to just outside Granby, we were back with the railway briefly and for once saw a passenger train. R125 passes into ranching country and heads north alongside the Willow Creek and through the Arapahoe National Forest where like elsewhere in Colorado, they have lost a lot of trees to a beetle infestation. We crossed the Continental Divide again over the Willow Creek Pass and descending, could see the smoke of fires behind the north end of the Gore Range off to our left. Heading towards Laramie, the road winds through small communities in the Medicine Bow Mountains where the town hall is a hut and on into the town where we will rejoin the Lincoln Highway tomorrow.